EDIT: I do not use this storage solution anymore, because it didn't scale very well to Dark Ages. Check out this post for the latest and greatest. Most important to me was that this was expandable. The idea of just grabbing a couple of boxes and playing with those isn't something you could really do here -- I use a smartphone app to pick my kingdoms, which means I didn't need to use the randomizer cards for anything important. I started this when I had just base + 2 expansions and now I have everything except for Dark Ages in the boxes; adding a new expansion didn't require me to completely redo the design, just to buy more card boxes. This is the reason my dividers are in three columns, so that I can insert a new card in there and still not have one divider right behind another. Yes, this means that they aren't in a pretty pattern, but I felt like this was a fair price to pay for an extensible design. I keep these in my board game bag that lives in the trunk of my car. It has wheels on it, so being heavy isn't so important, but durability and space efficiency are important. Using multiple small boxes allows me to conform Dominion to whatever shape is left in my bag after I put in the other games I want to play, which is really nice. This whole thing works because I made the randomizer cards into dividers. Once I got to 60 kingdom cards, I stopped wanting to use them to select my kingdoms, so it seemed like a natural way to use them. The tabs were made from taking the insert from each box, making a copy, and cutting out just the names of the cards. This worked for everything except the two promo cards I have, where I just hand-wrote them. They were attached by just using clear tape. My OCD resulted in a lot of cutting so that they look really nice, but that really isn't necessary. I found that as long as you double-layer the tape, they dividers stand the test of time pretty well. The relevant kingdom cards are located behind each divider; I found that having cards up against the back of the box was not a problem, but against the front of the box was, since you couldn't see the divider. So, there are some things in the front of the boxes to just take up space. In one box are the blank cards (with protectors) and the trash card that I never use. In another box I have extra card protectors with no cards in them -- these have come in handy many times. Also, the plastic containers I keep the extra chits in are handy for this as well. As mentioned before, this doesn't always get its own box, and that's OK, but if something has to be in the short box, it's definitely best to have it be this, since it helps a lot with setup and teardown, especially if you're playing multiple games. The cards in front of the dividers here are the starting decks for four players (though I'm not a fan of playing IRL games with more than 3 people). I realize that in a 2P game this means I'm not playing with enough copper, but I really don't care. Having the starting decks pre-sorted is extremely handy. 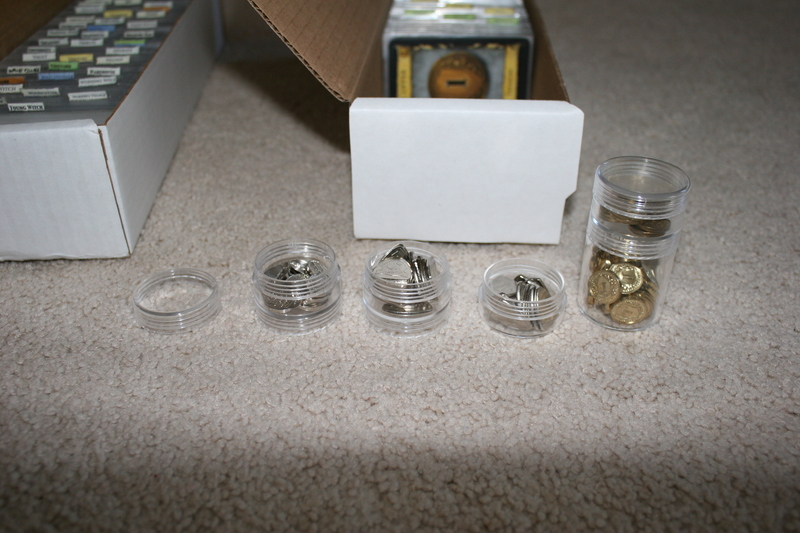 Those plastic containers contain all the extra little bits the game comes with: VP tokens, Trade Route tokens, Embargo tokens, and Pirate Ship tokens. A lot of people at my Local Game Store use these to store tiny bits in their games when plastic bags can be really annoying, and I really like them. It makes cleaning up a lot easier. I got them in the craft aisle at Wal-Mart, and it's for keeping all your different beads separated. I don't carry the extra mats that come with the game around in these boxes. Does anyone actually use those things? The boxes are just standard cardboard from my local game store, they are really cheap and they hold the cards even with the card protectors on. I know they aren't decorated very nicely, but once I am certain I have all the boxes I'll use for this in the end, I'll probably print off a nice big Dominion logo and cut it into pieces and tape it on there so it's all purdy. 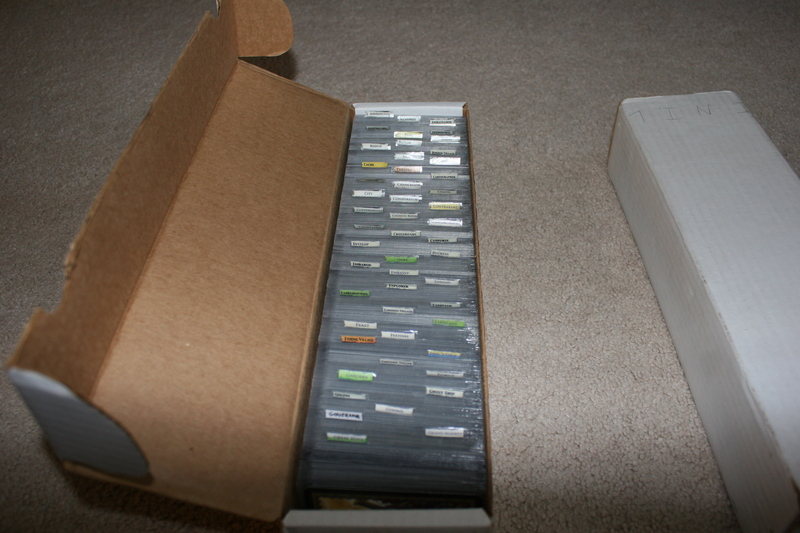 The big boxes are 800-card boxes, and I find I can just use those along with either a 400-card or 600-card box and things fit nicely. The supply cards haven't always been in their own box, but they are as of right now. When I'm playing an IRL game of Dominion, I'll have my app display the kingdom and I'll take the Supply Cards box for myself. I'll hand out the kingdom card boxes to my opponents and tell them to get busy, so this alleviates the main complaint in my group with Dominion, which is the long setup and teardown time of the game (they can't find anything real to complain about ). Keeping the cards in ABC order is nice because that's the way my app displays them, and they don't have to worry about which card is in which expansion, they just have to know the alphabet (which I know can be asking a lot to begin with). I usually take the Supply Cards box so I can make sure all of the extra chits that we need are available, curses, if we need them, and that there are the right number of the green/purple cards in each game. If I finish before everybody else, that's usually because there is an extra box of Kingdom cards (3 boxes, 2 players for example) and I can just grab that one so nobody is wasting their time. Unless certain kingdom cards are involved, you usually don't have to get out the Supply Cards box in between games, so it can be nice to have a separate box that you don't have to touch in between games to speed things up. I will be happy to answer more questions if you have them, including questions on how I made things if I didn't already address it in enough detail. I can post more pictures, but I can't promise that will be done in a timely manner. I will also be happy to accept +1's for this post if you feel so inclined. Stop stealing my ideas, please. Hey now, that laundry one was (accidentally) stolen from you, I'll admit, but not this one. This is way different from stuff you were talking about, and I've been refining this for quite some months now. If anything, I hope you might enjoy a different perspective on storage solutions. I even thought about putting this in that thread but it didn't seem to fit. ...and besides, imitation is the sincerest form of flattery. I definitely enjoy the perspective. In retrospect, the three-columned dividers would have been nice. And depending on how familiar my friends are with the game, I definitely see the advantages of alphabetical storage rather than by expansion. I just thought it was quite amusing. To alleviate tl;dr, I'll separate out the story part in case you don't care about how I made it. If you want to skip to the good stuff, it will be toward the end. Well, with the addition of Dark Ages, trying to fit everything into four boxes made everything pretty tight. I managed to make it work, even though it wasn't very pretty, and I had to split the M's between two boxes which really bothered my CDO. Then I got Stash, and it just didn't work anymore. I had to add a fifth box (a 400-er), I had to split the T's between two boxes, and it didn't fit in my bag well at all. It was already not working out well, and it was only going to get worse with Guilds. "Enough!" I cried. I vowed to search for a better solution. One that would contain all of Dominion in one box so I could leave room in my bag for other games (other games?! Who plays those?). I looked over the many storage solution threads for inspiration. If at all possible, I wanted to keep the cards horizontal, because as high-maintenance as my dividers can be, I really like them; they just require the cards to be stored horizontally. I calculated the total amount of space I needed and set out to find a briefcase with those dimensions. Turns out that doesn't exist. They don't make briefcases that big, since they like to make them thicker to add volume and I didn't want thicker, I needed longer and wider. I couldn't find a one-box solution where the cards could be stored horizontally (well, not that worked for me. I'll get to it in a bit). 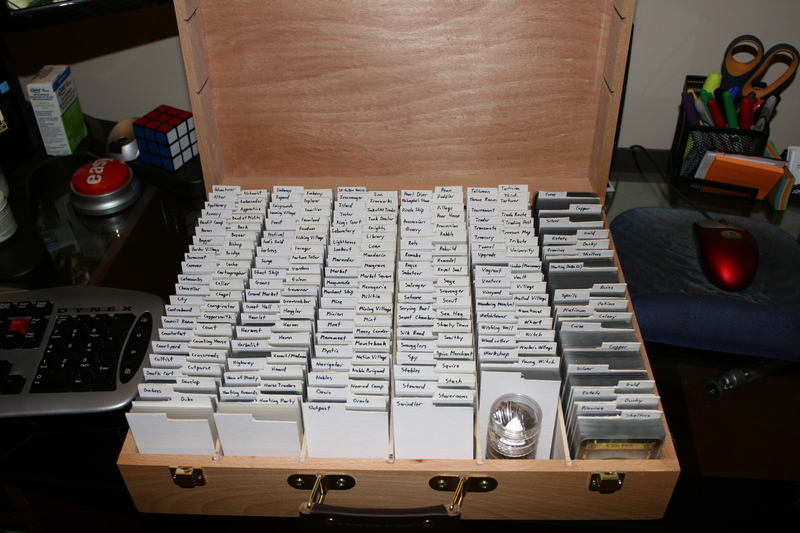 But I was pretty inspired by the following thread: anyone who has pondered a storage solution like this has probably come across it. It's actually possible to store the cards horizontally, but you can't use sleeves and I need my sleeves. With a heavy sigh I resigned myself to the fact that I would need to have vertical dividers if I wanted this to work. OK so this box. There's a guy in my gaming group that stores his Battlestar Galactica game in a box exactly like that (and usually he throws another game or two in there as well). It's a good box, and from what they tell me on that thread, it's cheap and easy to come by. It also will hold everything I could ever want with room to spare, they tell me. OK I like this box. I made a trip to Hobby Lobby and purchased all of my supplies for this. The box, some pieces of what I think is balsa wood for the dividers, and stuff for the card dividers which I'll talk about later. Assembly of the box went a little something like this: first, I gutted the box. Then I needed to put grooves in the top and bottom parts so I could slide in the dividers. I didn't really have the right tools for this, but I made it work by drilling a hole, then using this weird drill-like attachment on my Dremel™ to make it the right shape. After that I used a sanding attachment to smooth it out. I used another attachment to cut the balsa wood to the right size, and that was it. Box done. It works. The column on the right is actually slightly wider than the rest of them. This does not bother me. Now for the card dividers. The design needs to be extensible, but I'm not going to try and fit three tabs on the short side of the cards. I wanted tabs on the left and the right, and I wanted the dividers to be reversible so that if I needed to add a card, I could flip the positions of all the rest of them so that it can still alternate. Unfortunately, I can't use the randomizer cards for this anymore, because in order to make the divider sturdy enough, I'd have to make it so that you can't remove the card from the sleeve anymore, which I didn't want to do. With another heavy sigh, I resigned myself to create all new card dividers from scratch, despite all the work I had put into these other dividers. How to make these dividers? Well I've seen people's ideas and I don't like them. I just didn't like any of them. I'ma start from scratch here. I wanted rigid, reversible dividers, which means I would have to hand-write the card names on the tabs (both sides, so they will be reversible). I found large sheets of thick card-stock (probably closer to a thin cardboard, really) and figured I'd need three of them to get all the dividers I needed. After one night of cutting with a pair of scissors, my hand was extremely sore, so I invested in a paper cutter. This was a good decision. I ended up cutting way more of these things than I needed, but I'll have some left over for Guilds and spares so I'm happy with that. This was a LOT of cutting, and then a pretty decent amount of writing, but I got there. If I ran into one problem, it was my tendency to make the dividers too wide, so I had to take them to the paper cutter one more time to trim them. Not the end of the world, but I realized that the dividers not being full-width was not a problem at all, really. - Similarly with Spoils, even though it isn't a "supply pile"
- This problem isn't really a huge deal with Ruins, though, unless someone wants to track the Ruins seen in the other game to see which Ruins are more likely to show up in this game? Umm, yeah. Not an issue. The left-most five columns for the kingdom cards are pretty loose, so I think I'll be able to fit 150 more cards in there. The dividers ended up being pretty thick, but that's OK. If worse comes to worse, I can take out the second set of base cards; putting them in a 400-card box wouldn't be the end of the world. The right column is pretty tight. If Guilds adds any supply-ish cards, I may have to get a little creative. I haven't attempted to decorate this at all. 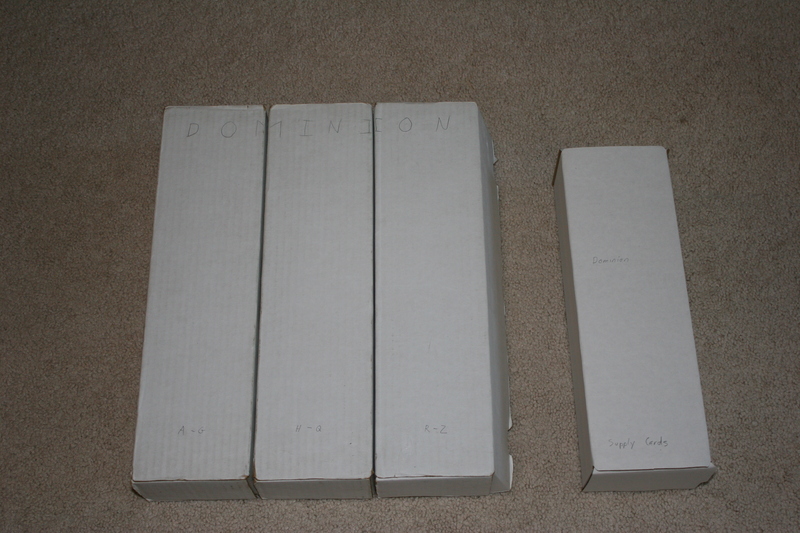 I'm thinking some helpful labels for the inside of the box lid and a big Dominion Logo on the front of the case. I am not gifted in the visual arts, though, so I may have to enlist the help of my much-more-crafty g/f for that. - Each column is cleanly divided by whole letters. I haven't had to split up the M's between the columns or anything like that. - I also like that it will be much more difficult for people to put my cards back facing the wrong direction now that they're vertical. This, of course, won't stop them from doing it just to troll me, but I think it will be a step in the right direction. - Without having to open and close 5 boxes, set up/tear down should be much quicker. It will be easier to put all the cards away and then get all the new ones out, as opposed to dealing with this operation 5 separate times and having to remember which ones are for last game/this game, etc. Also, the cost of missing a kingdom card and having to dive back into a box to get it is much lower (though I'll be sad that that method of ridicule will no longer be available to our group). Digging through my bag to get all five boxes out for the first game was kind of a pain before, but no more! - I carry a duffle bag on wheels in my trunk and to game nights. Dominion was taking up a LOT of space in that bag, and making it very heavy. The room I save by moving Dominion to a separate container (which can easily be carried along with the bag) should allow for a LOT more games to fit into that bag. - Hmm, I haven't really been using it long enough to tell yet. We'll have to see. Anyways, I'll be here to accept your +1s, respond to endless praise, and maybe answer questions if you have them. First of all, Guilds fit in very nicely. The rows are a little tighter but everything still works very well. The inside looks so similar that I didn't bother to take another picture of it. Inspired by The Hoppy Box I went and got a wood-burning tool. I had my g/f design a cover, and she chose to base it off the Cornucopia box art -- I asked her to make the design nice and simple so it would be easy to draw, but it turns out I could get a lot of detail with the tool anyways.. 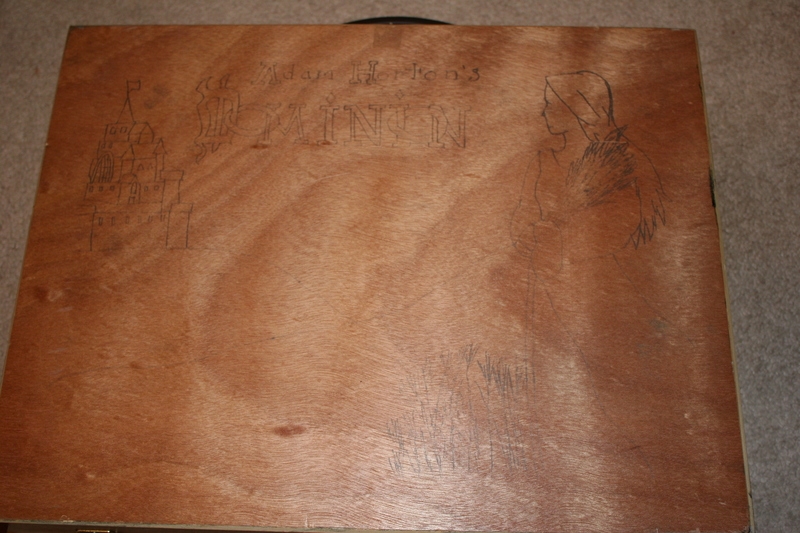 I then used some carbon paper to "trace" it onto the front of the box (EDIT: picture) and then used the wood-burning tool. It turned out not to be that hard to do and I think it looks great. Cards can be stored in "portrait" or "landscape" position (only landscape is practical for the two large buckets). I have stored them all in landscape save money and land cards. This is mostly because my dividers are in landscape format. Turn the cards in to portrait and you'll be able to hold quite some more cards. Very sturdy design. Fear not a mistaken unlock while transporting. Being sturdy, its weight is the flip side of the medal. Label says that it's being produced in Israel where allegedly it's produced in what Israel officially calls "Disputed Territories". I bought one of these hobby lobby boxes, and it seems they have changed the divider grooves on newer models. Fair warning to anyone who buys one now. Instead of dividing in to four rows vertically, it now divides in to three horizontal (and they are different sizes not appropriate for Dominion cards). That was the kind I got, I had to take the old dividers out and make new ones. It's no secret that I haven't exactly been pleased with the dividers I was using for the cards since I did this box. They were kind of thick and after lots of use, the corners are starting to fray. Some of the rows are pretty tight and it's starting to look less awesome. I've tried looking around some craft stores for something that would jump out to me -- a rigid plastic that is thin enough to be thinner than the cardstock-style things I had before, but thick enough to not bend and be durable and elegant. Nothing immediately jumped out, so the fiance and I went to the craft store a couple of weeks ago and tried out a couple of options. I won't bore you with the details of what didn't work, so we'll just skip to what did work. At Hobby Lobby, they sell small and large sheets of thin PlexiGlas™ material. I bought a hand tool for scoring/cutting it (I also bought a jigsaw blade for this, but the cuts looked really really bad) from Lowe's and eventually figured out how to score it properly and get nice, clean cuts. After getting the dividers cut down to the right size, I used a sanding-style attachment on my Dremel™ to round off the corners, since they were sort of sharp and pokey. At this point it was time to label the dividers. I just used custom-printable labels and printed them off on my computer, then cut them down to size and stuck them on the dividers. The labels are on both sides of each divider so that they're reversible (I had to reverse half of them when I put Prince in the 'P's so they would continue to alternate) so there are about 250 dividers with 500 labels here. A lot of time went into this, but nothing was done that was all that expensive or difficult -- just a lot of the same type of work over and over and over again. 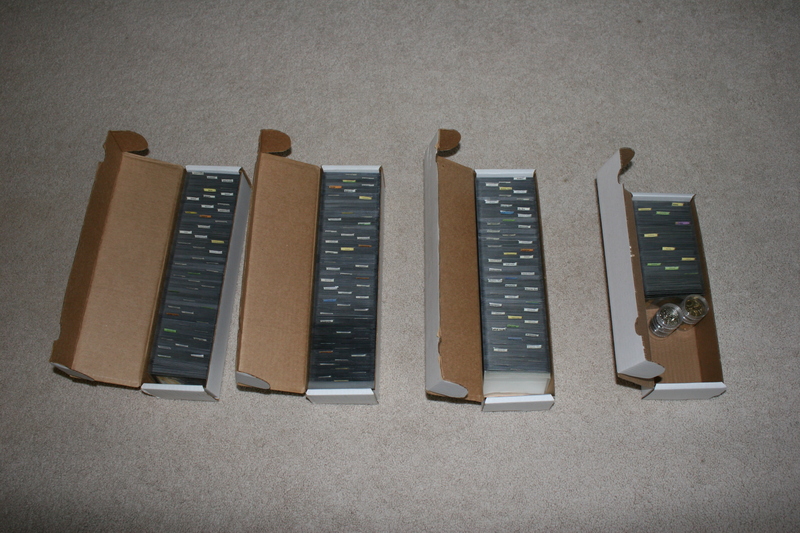 The second picture is a close-up of the dividers, and the third picture shows the whole box. All of the columns have enough room that the cards are easy to get out and there's plenty of room for extra stuff. so... is this box a bust now? I want a nice storage solution but I'm really really really not handy. 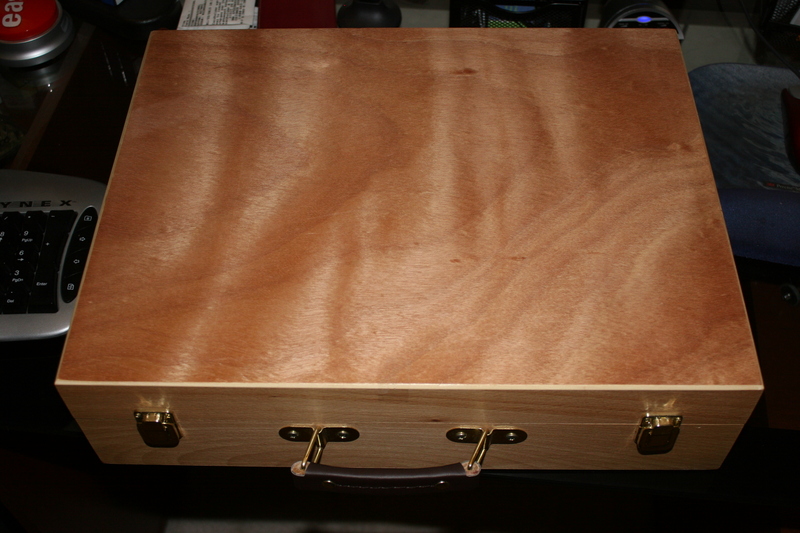 I don't consider myself to be all that handy, but I was able to put together a pretty nice-looking box. Getting something functional isn't impossible, but the more work you put in, the better it will turn out. The columns no longer have clean breaks between letters. My Ruins stack is only 20 cards now, 4 of each Ruin. I don't have any space for blanks anymore, there's only the extra sleeves and everything past that is used to play the game. The extra set of base cards that allowed for two simultaneous games to be played has been moved to a 400-card box that will probably live in my board game bag. That's where the other 30 Ruins are along with the other three player tokens. When I was making the dividers last summer, I had just found out about a new expansion (this is when I had been asked to playtest) so I made extra dividers, so I didn't have to make new dividers for this expansion, but the ones I used were a the more derpy ones. Before, I only needed to use the dividers that turned out well, but there are some visible scratches and weirdly shaped dividers in there. If there's another expansion, I'm gonna be totally screwed. There just won't be enough room. Here's hoping! Webspace is useful just for general stuff, and some people use their websites as a reference for jobs or something. Why do you have your own 90's-style website? Oh wow. Yes, that's pretty horrible. I'm guessing he made that on Frontpage. Nah, check the source. FrontPage was physically incapable of generating a website with fewer than 300 lines of HTML and embedded styles, most of which was useless. This appears to be hand-coded, though without regard to code style. Yeah I wrote this by hand when I was in high school, before I had taken any classes on coding. Thanks for noticing; I'm not sure if this is creepy. 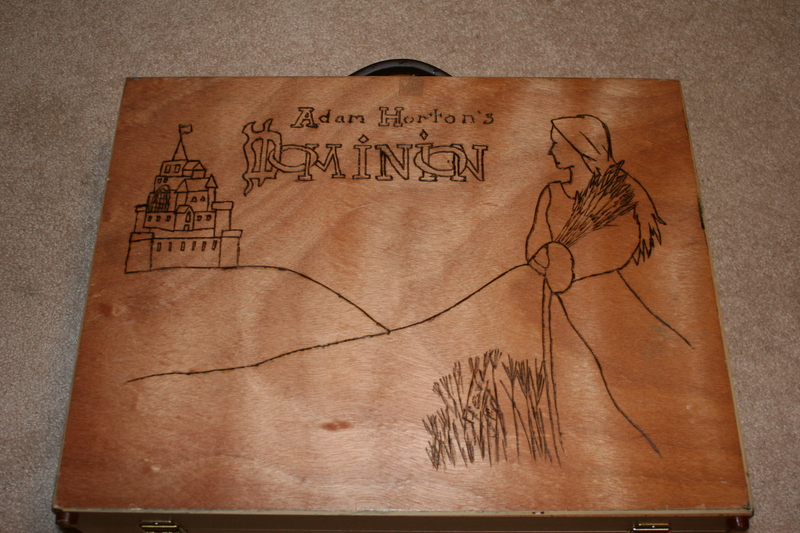 Does anyone actually like my Dominion box? I think your Dominion box is great. I wish I had the energy to create one. 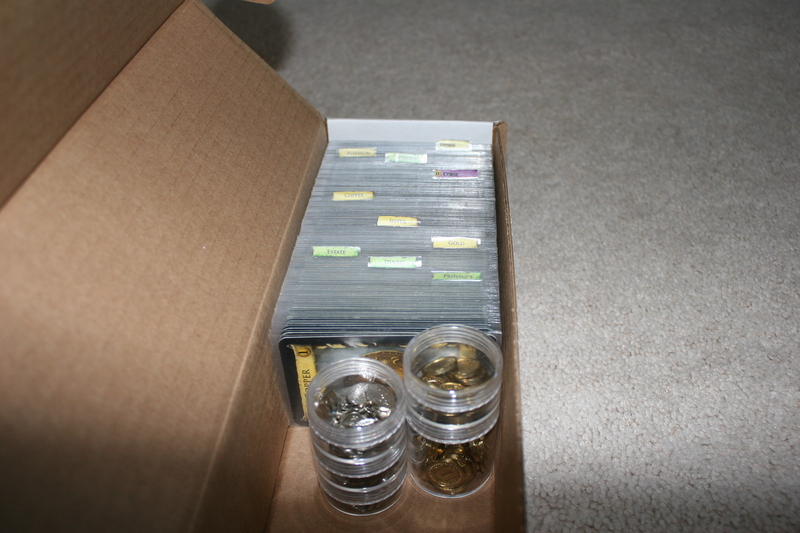 I just have all my card stacks in little baggies and fill up the original boxes with them. It works, but isn't exactly easy to find the things I am looking for. I like your box Adam. 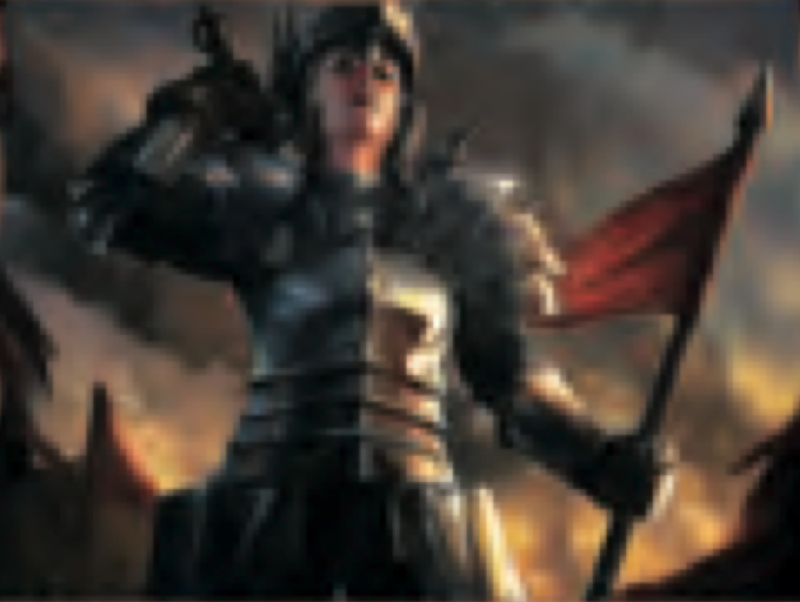 What sleeves do you use for your cards? They look excellent. With the new expansion coming out I'm debating whether to go this route for storage. I'm thinking two boxes would be necessary. This route would lead to their being enough space for everything, but the weight seems like a killer. Does anyone sell these on ebay or etsy? I'm not handy and would prefer to purchase something, though I would be willing to give making this a shot.